Fire Ants can be a painful reality for anyone living in the South. These invasive pests can render your lawn completely unusable and even endanger the safety of your children and pets. 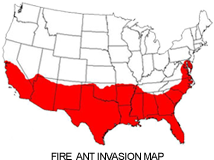 That’s where Peachtree Pest’s Fire Ant Control Team (FACT) can help. Our FACT pros are highly trained in the art of fire ant management. Combined with the latest in product technology, application techniques, and backed by an on-staff entomologist, our FACT team is the best in the industry. Give us a call today and discover why families and businesses across the southeast have turned to Peachtree Pest Control for a pain free lawn!